Two further triumphs at last night’s British Construction Industry Awards continues Ramboll’s run of award and industry league table success. Chapel Street bridge replacement landed Infrastructure Maintenance project of the year and Milford-on-Sea Beach Huts won Climate Resilience project of the year. We are absolutely thrilled to jump to 9th in the Top 150 Consultants league table from Buildings, as well as maintaining our position as 6th in their Top 50 Engineers index. Double success for Ramboll’s digital design team and the Dynamic Masterplanning toolkit at NCE Techfest and IABSE Future of Design. The BCI Awards that recognise outstanding achievements in the construction of buildings, presented the accolades during the 10th October ceremony. Chapel Street Bridge Replacement’s win recognises the significantly constrained and very complex nature of the engineering works and the vital part it plays in Network Rail’s £1bn Northern Hub infrastructure upgrade project. The Climate Resilience project of the year was awarded to Milford-on-Sea Beach Hut scheme, following their devastation in storms. 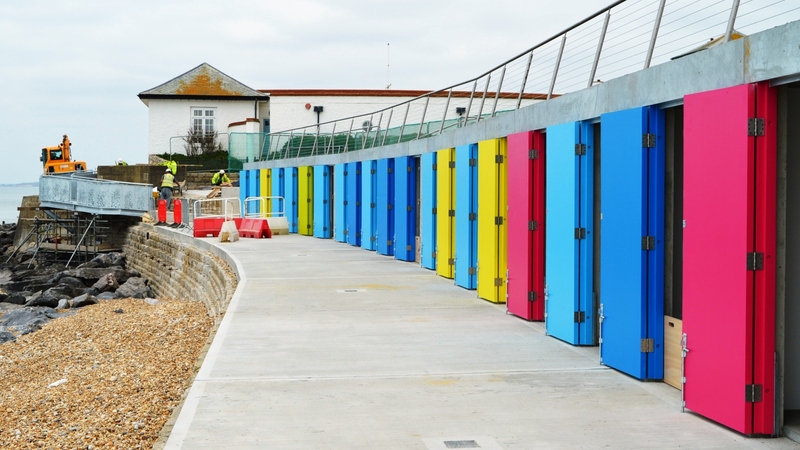 The project included a seafront improvement scheme and new beach huts capable of withstanding a 1:200-year storm. Commenting on the Milford-on-Sea Beach Hut win, Ramboll Marine Associate Damian Westlake said “It was pleasing to see that the judges appreciated that we had added so much value to the waterfront of Milford-on-Sea, far beyond just delivering a simple beach hut replacement scheme." This recent award success follows further recognition for Queensferry Crossing (AVS), Greengate Embankment 101 and Ordsall Chord at the Structural Steel Design Awards on 3rd October, receiving a commendation, merit and win respectively. Commenting on the Queensferry Crossing commendation, the judges said, "It embodies the knowledge in design, fabrication and long‐term maintenance, in the launching and finishing the twin box viaducts, from some of the world’s most accomplished bridge builders." As well as bagging dozens of awards already in 2018, Ramboll has rocketed up the leagues tables in both the NCE100 index (ranked 5th) and Buildings top 150 consultants (ranked 9th). “Soaring up industry league tables and winning prestigious awards is a testament of our people’s dedication to technical excellence and outstanding project delivery. Our creativity and digital know-how is continuing to bear fruit for clients and their projects and it’s heartening to see our people being recognised for this commitment” says Mathew Riley Managing Director for Ramboll in the UK. BCI Award winner. Chapel Street Bridge Replacement, Infrastructure Maintenance project of the year. The completed new superstructure. Chapel Street Bridge is a vital component in Network Rail’s £1bn Northern Hub infrastructure upgrade project, which includes Ordsall Chord. It is also a key part of Central Salford Urban Regeneration scheme.